WINNER TAKES ALL? We meet Appledore pilot gig club ladies A crew as following months of training on the river they race on their own water on Appledore Regatta Day. Filmed & edited by Matt Biggs (Artaura Productions) second camera Stuart Gaunt, sound recordist Josh Hawker, music by Alice Bollen, directed & produced by Jo Stewart-Smith. 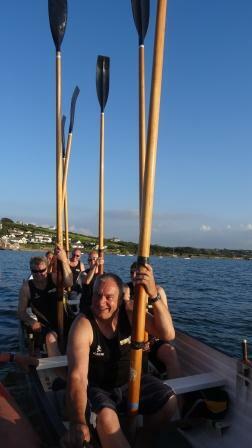 Thanks to Appledore Pilot Gig Club & all the other North Devon & South West gig clubs who raced at Appledore Regatta. 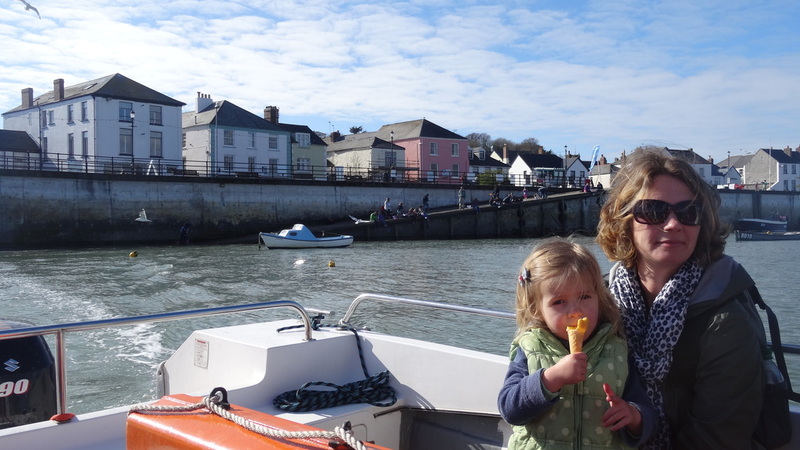 Quay café in the background behind the ferry slip - taken from Appledore & Instow ferry. I was tempted to compare and contrast the charismatic supervets and their laid-back style with the competitive ladies A crew. While the ladies are in the gym all winter – circuit training – the supervets wait till the sun is on their backs before they get out on the water. “Don’t get me wrong,” Locky said ‘we’ll train and we want to win –but when it’s over the ladies go back to their kettle bells and weights, whereas we need a steak and a pint or two.” We filmed the supervets training, but a few weeks before Appledore regatta we heard the supervets wouldn’t be racing because there was not enough water (tide) for all the races. This scuppered one storyline – but in the end they did get out on the water on race day - watch this outtake to see the supervets in action! 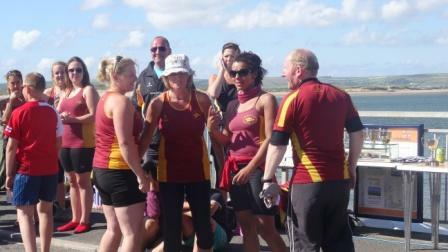 Congratulations to Linda who coxed the supervets to that win on in her maiden race as cox. When I first met Linda she had been training to be a cox for 18 months and was hoping to get her first race at the regatta… So it was fantastic to watch her excitement and nerves before the race and pure delight at winning. And if you are thinking – did they actually win? A few supervets teams joined the vets (the ancient under 40s!) and they all raced together. Appledore supervets beat the other supervets and a few vets’ teams –so I am told! Linda is a great ambassador for ladies gig rowing. ‘It’s one of the best sports for older women to get involved in - and one of the few sports where women can compete in mixed teams' she told me. Watch Linda (left) on why at the age of 47 she loves this sport so much. Len White, club chair and cox giving the ladies some advice during training. 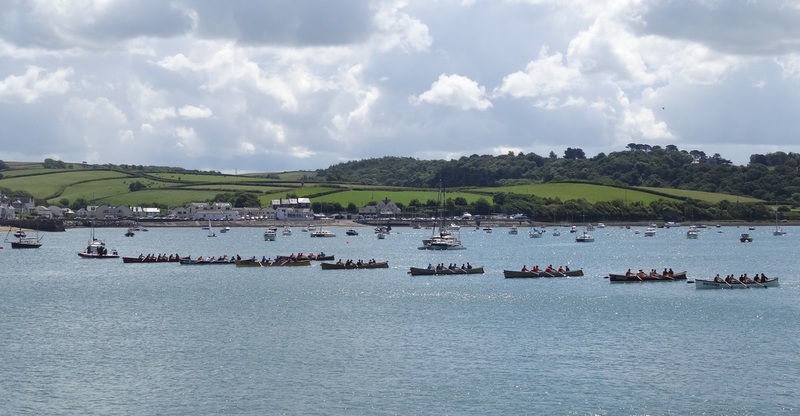 Appledore was the second club to set up in the area (after Clovelly) and in the last decade pilot gig racing has been one of North Devon’s fastest growing sports. Len has seen his club grow from tiny beginnings to an active membership of 70 plus, fielding teams of all ages. It’s also a sport in which you can go very quickly from turning up to your first trial session to rowing in your first regatta. Len was an extremely proud man on regatta day. And busy! Not only did he cox the ladies race in our film, he also started the other races. I noticed how he commanded plenty of respect. We watched him bellowing orders as one club transgressed and broke too soon –ordering the whole race to start again. 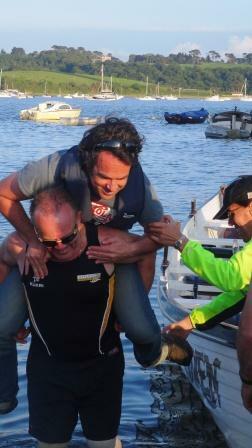 And he followed each race round in the safety boat. I would have loved to tell Len’s story or Linda’s or Locky’s but I only have five minutes! Note I haven’t even got past the ‘Ls’. Every time I watched the club out training or sprint racing I met a lovely new rower with a fascinating story – so much so that I was beginning to think I’d have to stop visiting and focus! On what? One theme that fascinates me is the friendly rivalry between Appledore and the breakaway club in the same tiny village – Torridge, which mirrors the history of the sport – the ancient rivalry between East and West Appledore in the days when several families from the village made their living as pilots. As Locky said, “It’s like Man City against Man United – everyone wants to beat their neighbours." 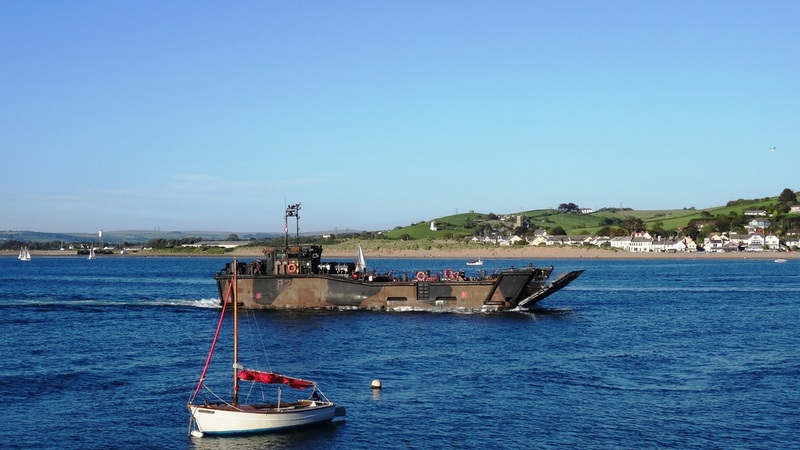 When a ship was sighted – waiting off the notorious Bideford Bar, Appledore families, often teams of fathers and sons (but occasionally women if they were nearest at hand) dropped everything and jumped into their boats. They rowed hard – hopefully with the current to get their pilot out to the ship – first. The winner – the first person to reach the ship was given the job – and got paid. The raising of the oars signalled that the job had been won. The losers had to row disconsolately back home with nothing. 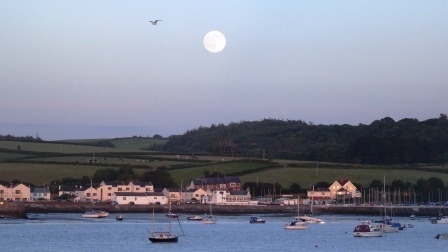 Those living in West Appledore had the edge, being closer to the bar and the incoming ships. So families in East Appledore used various ploys to overcome their disadvantage such as keeping a watchman on the point – or a boat out on the water – and of course there was completion against pilots from Clovelly who had a head start on ships coming in around Hartland Point. As Len told Boat Stories, “when you’re on the river – you want to win – back on land, in the pub, we’re all friends again.” But back in the day, villagers from West Appledore avoided speaking to those from East Appledore. Life got even tougher for the pilot families in 1921 when an agent from Trinity House arrived at Appledore Quay handing out forms to anyone who wanted to apply for the job of ‘licensed pilot’ and sit an exam! Six pilots were initially licensed for the Taw & Torridge area –well known local names today: Cox, Evans and Hocking. This didn’t stop the rivalry. North Devon is a long way from officialdom and many unlicensed pilots who had suddenly lost their trade continued to race out to the ships and offer their services. Bemused captains, arriving off the bar, had no way of knowing they were sailing into a cauldron of local politics and resentment. Court cases followed with the unlicensed pilots using excuses such as ‘’ships kept waiting’ ‘storms brewing’ and ‘life and death emergency.’ The fascinating history of pilotage is told in ‘and the pilot was Long Haired Jan’ by John Whitlock – thanks Locky for lending me the book! Piloting of big ships over the bar and in and out of the estuary still goes on today and this is a story I’d like to return to. Members of the overall winning club! Our title ‘Winner Takes All’ plays on this ancient rivalry and it is also the story on regatta day. As the races progress the scores are added up for each club. 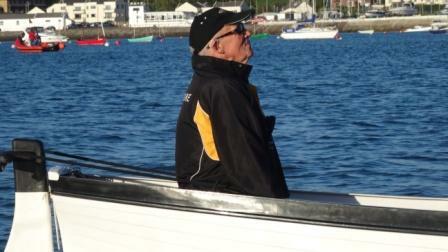 I’m not giving a spoiler if I say overall on Appledore Regatta Day 2014 Ilfracombe won by just ONE point. In each race and in the final reckoning it is the winning team who takes the spoils – the losers don’t even come up to the podium for second prize. It still is ‘winner takes all’ but not in our story – you’ll know what I mean if you’ve watched the film. 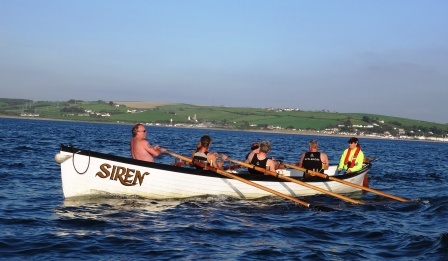 In the end our short film follows just one team (because we wanted to engage you in a story) but across the water from Clovelly to Ilfracombe everyone I met out gig racing was friendly and welcoming and would love new members to join their clubs. You can also find most of them on facebook and while you’re at it don’t forget to like our facebook page boat stories north devon. 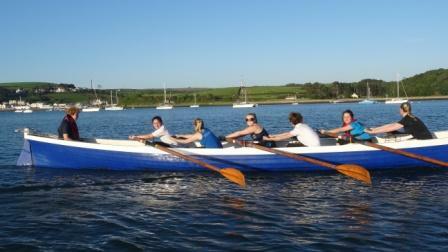 Clovelly – the first club to set up in the area, train in Clovelly harbour and Bideford Bay. Torridge keep their boats Kerens and Giggles on Appledore Quay and race in blue. 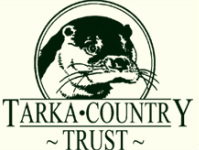 They have a strong junior crew ‘Oarsome Otters.’ I saw them out on the river training a few times and in 2014 they swept the board in many of the local regattas. If you don’t want to row –why not get to know your local team – their boats and their colours and take a day out to follow the races. As I write the crews are training for the World Pilot Gig Championships in the Scilly Islands. It’s the big one! Naomi who travels from Minehead to race with this team, counts the sleeps until the next Scillies. A huge thank you to Tash and the ladies team who let us film up close and personal, to Len who taught me about the history of gig racing and the club, to Locky who was always so generous and helpful, to the vets and the supervets, to Naomi and Linda and Siriol (I’ve got more outtakes up my sleeve to be released one day..) and to the whole club for being so welcoming to the boat stories team. Thank you also to Gary Stanbury (whose boat trip around the estuary is featured on our boat trip page) and Richard Mounce for helping us film boat to boat and allowing Matt to jump in and out of the gigs. Thanks also to my lovely crew: to Matt Biggs from Bideford based Artaura Productions for once again being so easy to work with, his creative camera work and thoughtful contributions to the whole film. To Alice Bollen who created the lively music, reacting to all my notes and turning out new versions in double quick time to meet our deadline. To Stu Gaunt for helping us film Appledore regatta and as always for being patient with my tech questions. To Josh Hawker our young talent who recorded the sound during the regatta (I still have an image of him leaping into the water to attach a radio mic just before the race started) and the interviews one evening out on the estuary when we were in competition with noises off: the lifeboat, the Oldenburg, the ferry, jet skis and a military hovercraft. Life is never dull when you’re out on the estuary. I love it! I leave you with Locky and Emily answering the question what rowing means to them.